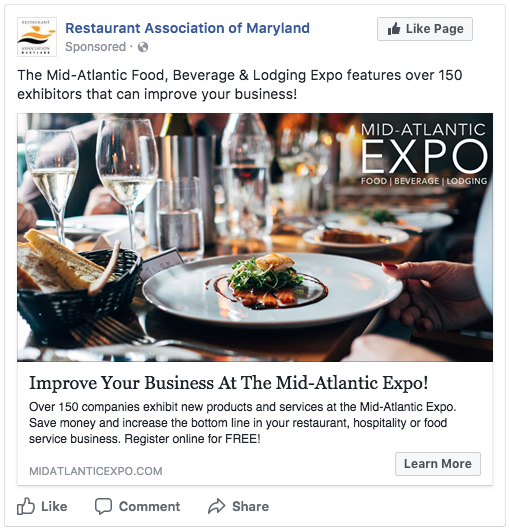 The Restaurant Association of Maryland (RAM) exists to promote, protect and improve Maryland’s foodservice and hospitality industry. 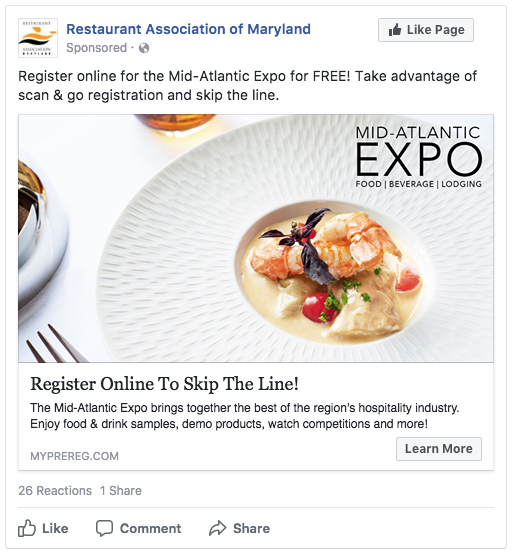 RAM leads by showcasing member restaurants, offering programs that reduce operating costs, and advocating for the interests of foodservice businesses. 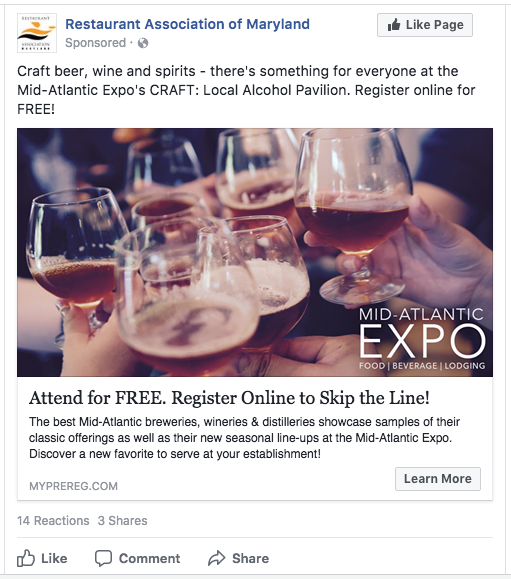 Each year, RAM hosts the Mid-Atlantic Expo, where 150 hospitality-focused companies from around the region demo products, while patrons enjoy food and drink samples, watch competitions and attend seminars. 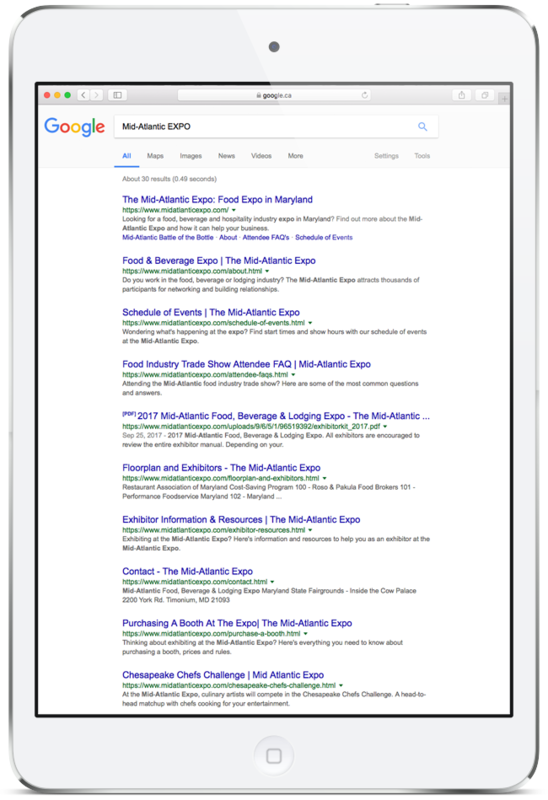 RAM approached Sociation for SEO and digital advertising services for their Mid-Atlantic EXPO website. 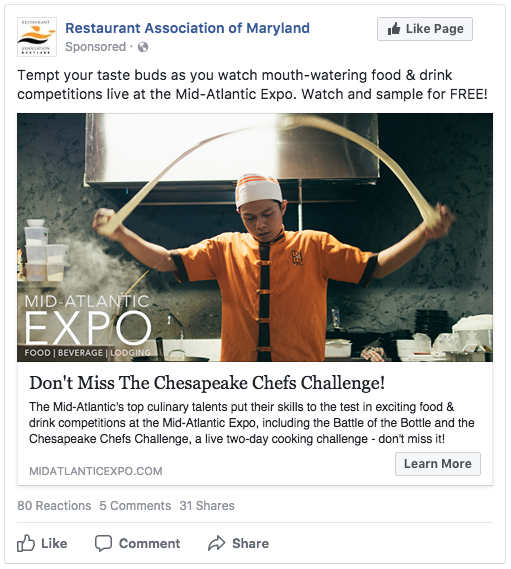 They asked us to optimize their website content and develop a digital advertising campaign to reach their industry-specific target audience to fill the Maryland State Fairgrounds with patrons for this year’s event. It was important for RAM to work with a company that could produce engaging creative, as well as one who truly understood the analytics behind digital advertising and had the technological know-how for search engine optimization of their WebLink website built on Weebly. We optimized their website and developed a social media advertising strategy to pinpoint their ideal target audience and focus on the channels their audience actively engages with – Facebook and Instagram. We developed a strategic placement schedule, created A/B versions for each ad and adjusted the campaign regularly over the 4-month period to maximize reach and engagement. The results: over 800,000 ad impressions, a total reach of 270,000 unique users and over 8,000 clicks. The event was a huge success. For more information about our client’s experience or how Sociation can help you with SEO and Digital Advertising Services, please contact us.